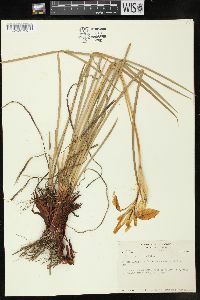 Rhizomes freely branching, producing large colonies, stout, 2-3 cm diam., clothed with dark remnants of old leaves; roots fleshy. 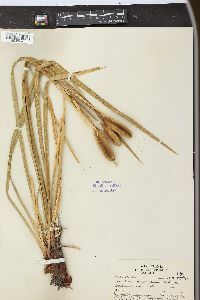 Stems simple or 1-2-branched, solid, 2.5-6 dm. 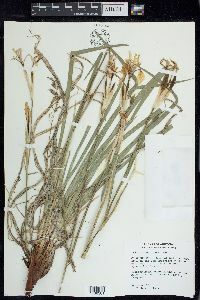 Leaves: basal with blade light green, often white basally, not prominently veined, linear, 4.5-6 dm × 0.3-1.2 cm, glaucous, apex acute; cauline 2-3, often shed with spent stem, similar to basal leaves, distal may subtend branch. 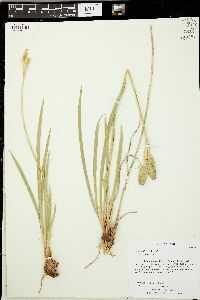 Inflorescences with terminal and lateral units (when present) (1-)2-3-flowered; spathes subopposite to distant, to as much as 3-7.5 cm apart, lanceolate or ovate, keeled, outer usually shorter, 3.5-4 cm, inner 5.5-7 cm, scarious with herbaceous areas basally and along keel, apex acuminate. 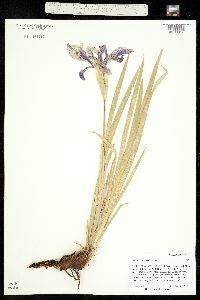 Flowers: perianth blue to lavender to white, veined deeper violet; floral tube green with purple veins in line with midrib of petals, funnelform, constricted above ovary, 0.5-1.2 cm; sepals deeply veined lilac-purple, with yellow-white signal at base of limb, claw yellowish white, veined and dotted with purple, obovate, 3.7-7 × 1.2-3.2 cm; petals slightly divergent, oblanceolate to spatulate, 3.6-7 × 0.5-1.2 cm, base gradually attenuate, apex acuminate or rarely emarginate; ovary trigonal with 6 shallow ridges, 1-2 cm; style 2.4-4 cm, crests quadrate, 0.7-1.4 cm, margins irregularly toothed; stigmas 2-lobed, margins entire; pedicel slender, 1-6 cm at anthesis, increasing to 7.5-8 cm at maturity. Capsules almost circular in cross section, with 6 obvious, equidistant ridges, 4-5 × 1.5 cm. 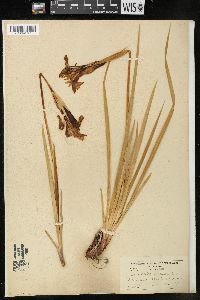 Seeds light brown, nearly globular to pyriform, 4-4.5 mm, wrinkled. 2n = 38. Flowering May--Jul. 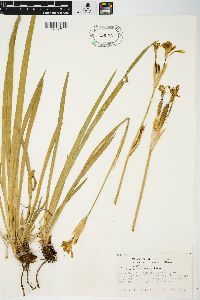 Wet meadows, roadside ditches, margins of streams; 10--3000 m; Alta., B.C. ; Ariz., Calif., Colo., Idaho, Mont., Nebr., Nev., N.Mex., Oreg., S.Dak., Utah, Wash., Wyo. ; n Mexico. 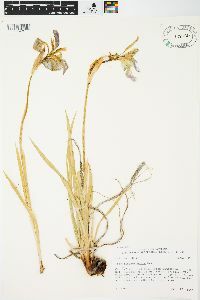 The ecological range of Iris missouriensis is probably more varied than that of any other North American species of the genus, extending from almost sea level in southern California to 3000 m in Montana and Wyoming. 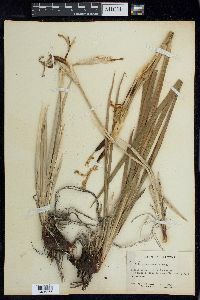 There is correspondingly wide variation in a number of characters, which has caused much confusion as to taxonomic circumscription. Homer Metcalf (pers. comm.) made a detailed study of this species. The basic requirement for its success seems to be an extremely wet area before flowering and then almost desertlike conditions for the rest of the summer. 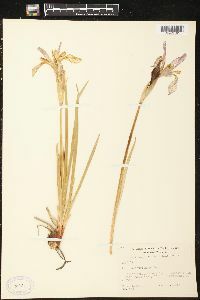 In large populations, sometimes covering hundreds of acres, Iris missouriensis may be found with either simple or branched stems, leaves from 4 mm to more than 1 cm wide, shorter than the stem or longer, only one flower to as many as three on a stem, and colors from deep blue to almost pure white. 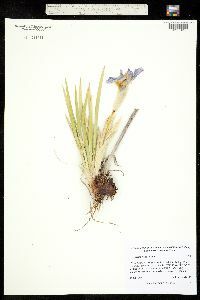 A single plant found on the Pariah Plateau in Kane County, Utah, with leaves only 3-4 mm wide and a single flower stem only 4 cm long, which meant that the flower was at almost ground level, was named Iris pariensis. 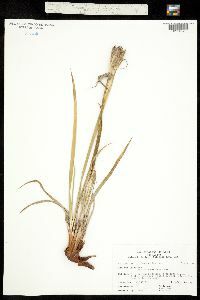 No other such specimen has been located, and this entity must be considered as just an aberrant form that was due to the desertlike conditions in which it was growing. 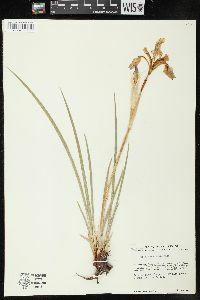 Iris missouriensis is known to hybridize with I. longipetala. 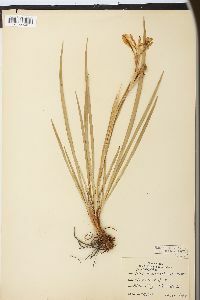 Plant: Rhizomatous herb; 2-5 dm tall, with rhizomes 1-2 cm thick Leaves: mainly basal, linear, 6-75 cm long, 3-10 mm wide INFLORESCENCE: solitary or few to many borne in paired spathe-like bracts Flowers: 1-4 on stems 20 to 80 cm long, the spathe-like bracts scarious or greenish, lanceolate to ovate, 2.5-7 cm long, 6-12 mm wide; perianth tube 5-8 mm long; sepals 4.5-6 cm long, obovate to oblanceolate, the claw elongate, expanding into a light blue to white blade with blue to violet nerves and a patch of yellow in the center; petals 4-5 cm long, oblanceolate, erect, pale blue to white; anthers 10-15 mm long; style branches 1.5-2.5 cm long Fruit: FRUITS capsules, loculicidally dehiscent, 3-6 cm long; SEEDS few to many Misc: Moist meadows; 1850-3100 m (6000-10200 ft); May-Jul REFERENCES: Mason, Charles T., Jr. 2001. 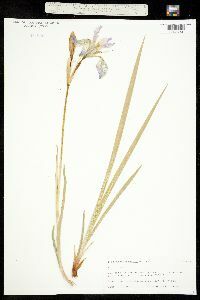 Iridaceae. J. Ariz. - Nev. Acad. Sci. 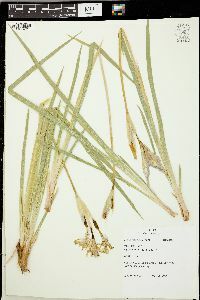 Volume 33(1).